Ray Kennedy has had a lot of roles in his long career in the music industry: He leveraged a successful career as a Nashville songwriter into becoming a successful country-music artist, going on to become an in-demand recording engineer and record producer, working on records for artists including Steve Earle and John Mellencamp. 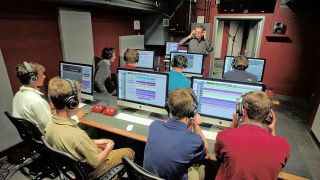 Instructor Ray Kennedy directs students at Nashville’s Montgomery Bell Academy in the school’s recording classroom/lab featuring RedNet interfaces from Focusrite. And now he is influencing the next generation as a teacher and the force behind the newly built recording classroom/lab at Montgomery Bell Academy, a Nashville boys school for grades 7 through 12. Kennedy designed the school’s new audio-production facility, where he is also the primary instructor, relying on Audinate’s Dante protocol and Focusrite’s RedNet range of Dante-networked audio converters and interfaces to create a truly interactive teaching and learning environment. The lab, which Kennedy carved out of a space directly underneath the school’s 1,000-seat performance auditorium, utilizes the following RedNet components: a RedNet A16R 16-Channel Analog I/O interface, which offers 16 channels of Dante-networked A-D and D-A conversion with network and PSU redundancy; 18 RedNet AM2 Stereo Audio Monitoring Units, which combine headphone and line outputs for monitoring of signals from the Dante network; and a RedNet MP8R eight-channel mic pre and A/D converter. Collectively, these RedNet units give the school and its students an interactive backbone that enhances teaching and learning. “Using RedNet, the students and I are in a two-way environment—one where I can monitor them as a class and individually—which really helps deepen the engagement between us,” said Kennedy, who takes a hands-on approach to his role. He can monitor from his teaching station any of the six fully-loaded Apple iMac workstations in the classroom and listen through the RedNet AM2 as students individually work on their own assignments. Kennedy is then able to critique and offer advice and suggestions regarding the students' work. In addition to recording from the tracking studio, RedNet allows the ability for remote recording from the auditorium upstairs or any of the networked locations across the school’s campus.